For a typical high school classroom, climate models and what they are need to be defined and understood prior to using this interactive. The related stories below the tool could be used to have students debate the consequences of climate change on electricity use, adequate water supply, and wildfires. Students can investigate projected temperature changes for the state of California given two different carbon emission scenarios. They can also graph temperature changes predicted for their town within the state of California. Comments from expert scientist: This animation of future climate scenario temperature predictions allows the user to look at average decadal low, average, and high temperatures for the southwestern United States. Students can change between model runs and ensemble runs, and change from temperature to sea-level-rise to snowpack to precipitation. This interactive tool is a great way to explore future climate predictions, if one accepts that regional-scale predictions of surface temperatures from global climate models are accurate enough to examine on a regional basis. Interactive is easy to use with clear user interface. Students can investigate how different climate models change the predictions of future climate change. Very relevant for students since they can zero in on their community and part of the state. 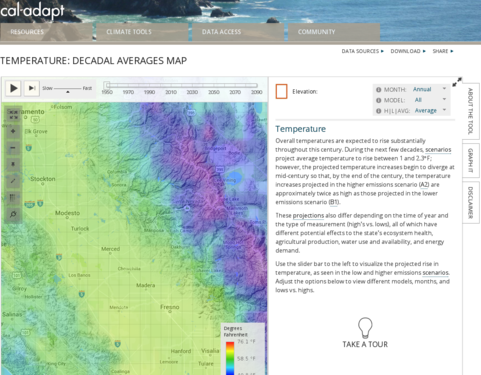 Offers supplemental background information on climate change topics in California with references to the original publications. See http://cal-adapt.org/blog/categories/understanding-climate-change/] and [http://cal-adapt.org/blog/categories/climate-stories/. Interactive tool very clean and well-designed. Easy to use. An instructions tab is located at the top menu bar that briefly outlines the tool. The tool is specifically designed for the state of California only.